Meet New York City’s Harbor Herons! We were happy to find a total of 41 yellow-crown nests in the Redfern colony this year, one more nest than our 2013 count—and pleased to see that Redfern residents seem to appreciate “their birds.” Red Fern’s nesting colony is just one of eleven wading and waterbird nesting colonies that NYC Audubon has been surveying these last two weeks of May, adding to more than 30 years of survey data on New York City’s colonies of herons, egrets, ibis, and other waterbirds. Unlike Redfern’s unusual and very urban colony, the rest of our nesting colonies are located on wild island preserves in New York Harbor: South Brother Island, Huckleberry Island, U-Thant Island, and Mill Rock on the East River and Long Island Sound; Hoffman and Swinburne Islands of off Staten Island; and various island in Jamaica Bay. 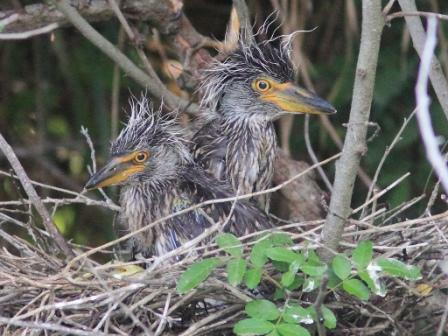 Teams of surveyors have been doing careful nest counts of these island colonies of great and snowy egrets, black- and yellow-crowned night-herons, little blue and tricolored herons, and glossy ibis, along with double-crested cormorants, gulls, and other waterbirds. This year’s survey data is not yet complete and has yet to be analyzed, and will be reported later this year. 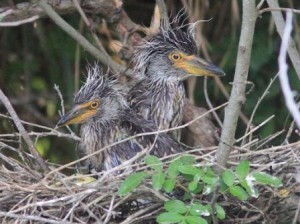 To read more about the Harbor Herons nesting surveys, please click here. Though our surveying teams must access the harbor heron islands with special permits and survey the colonies under challenging conditions (imagine wading through poison ivy with angry cormorants vomiting fish onto your head! ), you have the opportunity to see the island colonies firsthand and in complete comfort on NYC Audubon’s Sunset Ecocruises to the Harbor Heron Islands. Departing from Pier 16 at South Street Seaport selected Sundays from June 1 through August 17, the tours explore three different routes: Sail up the East River to the fascinating Brother Islands, down under the Verrazano Bridge and past the Statue of Liberty to the large egret and cormorant rookeries of Hoffman and Swinburne Islands—or visit the vast, wild expanses of Jamaica Bay National Wildlife Refuge. Click here to register.